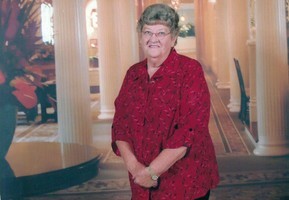 Provide comfort for the family of Gwenda Edwards with a meaningful gesture of sympathy. Gwenda L. (Williams) Edwards, 78, a 16-year Wenatchee resident, passed away peacefully surrounded by her family. She was born on April 3, 1940, at Arlberg, Arkansas, to the late Onvie and Ola (Lamberson) Bane. She moved to Bridgeport, Washington, at the age of eleven, where she attended school. She later met and married Cliff Williams on November 24, 1956, at Coeur d’Alene, Idaho, and made their home in Bridgeport raising 5 kids. She worked in the fruit packing sheds, Bridgeport grocery store and the Security Bank. In 1982, she married John Edwards and became a Snowbird, eventually making their home in Spokane. She moved to Kirkland in 1993 to be closer to her mother, Ola Lamberson, while attending college and working as an Office Manager. She remained in Kirkland until moving to Wenatchee in 2002. Gwen’s dearest and closest companion was her dog, Lady, and friends, Bobbie Turner and Karen Rudman. She was a member of the WVSAC Wii Bowling League and bowled a perfect 300 game. She loved slots, bingo, cards and visiting either on her phone or in person. She was an avid sports and racing fan. She enjoyed reading and trading books with her friends and family. And she most definitely loved her sweets. She is survived by four children: Sonja Rhodes, East Wenatchee, WA, Chuck (Stephany) Williams, Puyallup, WA, Tammy (Rob) Ingram, Wenatchee, WA, and Jeff (Teresa) Williams, Bremerton, WA; brother, Ron (Hilde) Bane, Lacy, WA; sister, Sherry (Larry) Hansford, Lynnwood, WA; eleven grandchildren; seventeen great-grandchildren and seven great-great-grandchildren. She is preceded in death by her parents, a son, Dave Williams, son-in-law, Bill Rhodes; and boyfriend, Bill Schultz. A Celebration of Life will be held at 1:00 p.m., on Saturday, February 23, 2019, at Heritage Memorial Chapel, 19 Rock Island Road, East Wenatchee, WA, with a potluck reception to follow. You are invited to visit Gwen’s online tribute at www.HeritageMemorialChapel.com to leave a condolence or share a memory. Arrangements are in the care of Heritage Memorial Chapel, East Wenatchee & Cashmere. 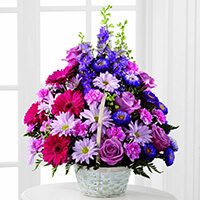 To send flowers in memory of Gwenda Lee Edwards, please visit our Heartfelt Sympathies Store. We encourage you to share your most beloved memories of Gwenda here, so that the family and other loved ones can always see it. You can upload cherished photographs, or share your favorite stories, and can even comment on those shared by others. The family of Jeff and Teresa sent flowers to the family of Gwenda Lee Edwards. Gwen was an amazing woman and had a great impact on my life. Without a mother, Gwen never hesitated in filling the role when asked if needed during my high school years, and even in adulthood. I watched her carefully as a mother to her children. I noted she was always at her son's sporting events. Always. Her 5 children's #1 fan in everything they did. She would attend Mother-Daughter tea events with me so I could have a mother representation. She always had a listening ear, provided hugs and the emotional support I needed. I loved her family. As I grew older she became a dear friend, and at times grandma Gwen to my children when she lived in Spokane. After she moved to Wenatchee our communication became less but stayed in touch. I'm so thankful we talked a week before she went home to be with the Lord. She asked about my children, and wanted to know what all five son's were doing with their life. She shared her pride of her children and grandchildren. She told me her spirit and heart were in the right place. She was ready, tired, and didn't want her children and family to be sad. Tears were shed and appreciation was voiced. As I raised my boys,I made it a point to be at my 5 son's school events, each and every one. I was their #1 fan, and still am. I've been a "mom" to many girls who needed a step in,listening ear, or a hug. Gwen,I was watching you. I love you and so thankful you had such an impact on my life. You showed me that raising 5 children can be done, and how it is done. Thank you for loving me. Mom, Grandma, Great Grandma we love and miss you! You will forever be in our hearts. We will always cherish the memories. Until we meet again. Love you! The family of Jeff and Teresa purchased the The FTD Pastel Peace Basket for the family of Gwenda Edwards. Gwen was a longtime friend who always had a smile, a bit of advice and most of all a big hug! Our paths in life sometimes drifted miles apart but when we got back on the same path it was as if it was yesterday! That is a true friend. I will miss her very very much. Until we meet again..................Karen. There is so much sorrow in the world. But the death of our loved ones brings the deepest sorrow of all. May God’s promise to help you through this difficult time bring you peace, (Isaiah 41:10) and his promise for the future (John 5:28, 29) give you a wonderful hope.